If you are one of the presenting at ASA I know you have been working hard. When you speak at a national conference it’s after years of hard work. First, it was planning your program or services. Then it was developing the project or program. Next, it was the implementation. Finally, the analysis and project reporting. 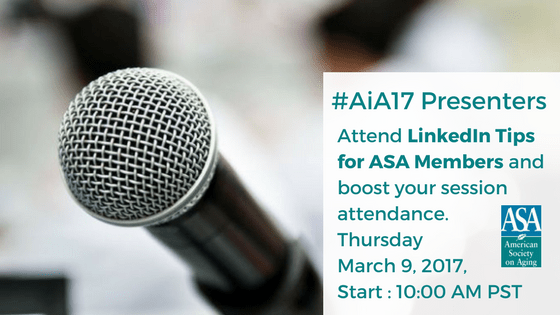 Now at #AiA17 you have the opportunity to share the results of your work. In this online seminar, you will learn how to connect and create more “buzz” around your session. Learn how to optimize your profile, use advanced search features, and create a strategy to maximize your conference experience. Currently, Judi Bonilla is the Director of Program Innovation at Advocates For Aging. She is the first gerontologist to speak at South by Southwest. Judi has also spoken at the American Society on Aging and Certified Senior Advisors conferences. She also served as a fellow for Hispanics in Philanthropy and Senior Service America. Judi is the author of Freewheeling After Sixty a book for older drivers. In addition, you can find her at theaginexpert.com.